The TEAS-Plus system imposes a $50 per trademark class penalty on any filer of a “Plus” or “RF” (reduced fee) application who files a response by means other than e-filing. USPTO needs to not impose that penalty on those who responded to a Plus or RF office action by means other than e-filing during this system crash time. I have been seeing a bit of a trend lately. The trend is free wifi that is bla zing fast, many tens of megabits per second both up and down. At right is a speed test result for the free wifi in the Wisconsin state capitol in Madison, Wisconsin. And this did not even require me to accept some terms and conditions. Some time ago a friend was in the new Whitney museum in Manhattan. Again blazing fast, eighty megs down and fifty megs up. And again no need to accept terms and conditions. It’s nice when this happens. What’s the fastest free wifi you have encountered? Please post a comment. The last time I tried to use the public wifi at the USPTO, which was a few months ago, the login process was so cumbersome that eventually I gave up and used my own wifi hotspot instead. The last time I did successfully log in to the public wifi at the USPTO, which was a few months before that, it was embarrassingly slow, slower than 100K bits per second up or down. Basically voice phone modem speeds. Can someone who has recently made use of the public wifi at the USPTO share a comment about how fast the wifi was, and how easy or difficult the login process was? For many years it has been possible to recycle ADS bibliographic (“bib”) data from a parent case into a child case. To do this, you find the old ADS and export the bib data in XML format. Then you import the XML file into a new ADS. Often you will find that before you import the XML file into the new ADS, you need to edit the XML file using Notepad. USPTO has just announced a new EFS-Web functionality with the catchy name Enhanced Initial Web-based Application Data Sheet. I’ll call it EIWADS. On November 22 I offered suggestions (see blog post here) as to how USPTO could do better in receiving updated bibliographic data. I also blogged about what was at that time the Best Practice for updating bib data. On December 21, USPTO announced its new Corrected Web-based Application Data Sheet functionality. I will describe it in this post. I think it will probably be a Best Practice to use this functionality (for the applications for which it may be used) rather than legacy practice. On December 12 I blogged about a problem namely that when USPTO revised its computer-readable ADS form, USPTO broke the XML import feature. Due to a change in the Adobe software used to create PDF fillable forms, the “Import Data” function is unavailable in the new ADS PDF fillable form. We are working with the vendor to troubleshoot this problem and apologize for any inconvenience. Hopefully in future when USPTO (or its vendor) tinkers with the ADS form, part of the acceptance testing will include looking to see whether the tinkering has broken the XML export or XML import feature. While they are at it, I will mention that for some six years now, I have been gently but persistently asking the USPTO to please publish a DTD (document type definition) that pins down the USPTO as to the names of the XML tags and the tree structure of the XML for the ADS. In any normal XML environment, the party establishing an XML import or export function publishes a DTD. For six years now, USPTO has foot-dragged and has not done so for the ADS. Maybe this activity of USPTO and its vendor will be a good moment for USPTO to reveal the DTD. There have been several reports on the EFS-Web listserv that EFS-Web is puking on its own PDF forms. The chief trouble area is the Application Data Sheet form. The user carefully creates a computer-readable ADS and uploads it to EFS-Web. EFS-Web then pukes on the form, stating (falsely) that it is not really a PDF file. The workaround is to print the ADS to PDF using CutePDF. 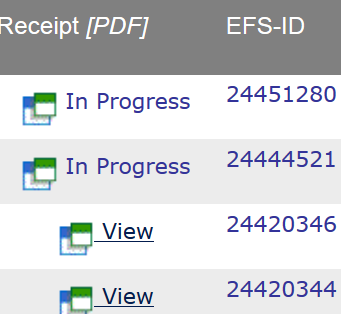 Then that PDF file can be uploaded to EFS-Web. EFS-Web will gripe that it is not an official USPTO form but will at least permit the e-filing task to be completed. In the old days I would have characterized this as a Big Problem because in the old days, EFS-Web actually auto-loaded the bibliogaphic data into Palm (and from there into PAIR). But (as I blogged here) USPTO has been gradually chipping away at this and now almost none of the bib data gets auto-loaded. So you might just as well upload a CutePDF version into EFS-Web. EFS-Web is working but … don’t get your hopes up that you will be able to see results in PAIR. Not only that, don’t get your hopes up that you will even be able to see your Acknowledgment Receipts. We filed one new patent application this morning at 7:27 AM Mountain Time. It’s now 1:45 PM Mountain Time, meaning that more than six hours have passed. And despite the passage of six hours, the newly filed application is not visible in PAIR. And indeed when we click on “View last 40 eFiling Acknowledgement Receipts” we are not permitted to view the ack receipt for this filing of six hours ago. Instead the ack receipt has the dreaded “In Progress” legend instead of a “View” link. This would have been a really good day to staff the EBC. But I am pretty sure we won’t be able to reach anyone at the EBC until tomorrow (Monday) morning. I would have asked the EBC to “open a ticket” to get our case into PAIR, this case that we filed more than six hours ago. We filed another new patent application this morning at 11:29 AM. That’s more than two hours ago. Still not visible in PAIR. Still no ack receipt, only the “In Progress” message. But anyway yes EFS-Web does seem more or less to be working. If you do an EFS-Web filing today and if you later actually see your results in Private PAIR, I would be grateful if you can post a comment about it. Now Private PAIR is up again. This time it has IFW. Hopefully Private PAIR will continue to be working and hopefully IFW will continue to be working. As I reported earlier today, EFS-Web is also back in service. Hopefully it will likewise continue to be working. EFS-Web seems to be back online today, December 27. As we all recall, EFS-Web crashed on the afternoon of Tuesday, December 22. In my case I was in the middle of trying to file a design patent application when it crashed. Fortunately I had been doing frequent saved submissions during that project. Today when I logged in at EFS-Web, my saved submission was there. I completed the submission and clicked submit and paid the fees. As far as I know, it worked. I say “as far as I know” because unfortunately Private PAIR is not working. So if you e-file a new application in EFS-Web, you are not able to check in PAIR to make sure it came through okay. But anyway it is good news that USPTO seems to have gotten EFS-Web back online. It’s perhaps too soon to assume that EFS-Web will continue to be working. Private PAIR worked for about a day (albeit without an IFW tab) and then stopped working. And now Public PAIR is working with an IFW tab. USPTO seems to have gotten IFW back online, although only within Public PAIR. Private PAIR worked for a little while a couple of days ago, but has not been functioning for the past 18 hours or so and is not functioning just now.